The Espresso Book Machine is several years old but is still something of a rarity (it's an expensive piece of hardware), so I am always pleased when I hear of a new one being installed. Last night I learned of a new EBM being installed in a public library in Loudoun County. The EBM is located at the Rust Library in Leesburg, which means it is about 43 miles away from me. That is not actually local, though it is close than the the EBMs in bookstores up in DC (Politics & Prose, for example). This particular POD unit been given the name Symington Press in honor of the late library patron whose bequest made this and other tech projects possible. It's one of about 80 that have been installed in libraries, universities, and bookstores around the world. It was installed in May and is currently operational. If you want to have a book printed your options include 5 million public domain and publisher-supplied titles listed in On Demand Books' catalog. You can also have a self-pubbed book printed, but it will need to be formatted and laid out before sending the files to the staff at the library. That latter option is quite popular, with most EBMs spending 90% or more of their time producing self-pubbed books instead of books from On Demand Books' catalog. I've been following the rise of the Espresso Book Machine for the past several years, most recently with Books-a-Million installing an EBM in a store in Maine, and as I read about this latest installation I'm reminded that EBM is disappointing in several ways. I'm not just referring to the fact that thecore component of the EBM looks so kludged together that the engineering school at Carnegie Mellon could probably build a better device, but also to the missing pieces of On Demand Books' platform. For example, there's no way to go online and simply order a book printed, pay for it, and then choose a location. Instead you have to email the details to whoever owns the EBM that is going to print the book you want, and then you have to pay in person. This is 2013; even my local Chinese carryout lets me order online now. The fact that the EBM lacks such a basic online platform is frankly a sign that this is still merely a hobbyist solution and not a commercial or professional platform. Hopefully the ongoing partnership with Kodak will fix that. A deal between On Demand Books and Kodak was announced late last year which has a goal of adding more POD features to Kodak picture kiosks. The technical details are still being worked out, but I have high hopes that one day you'll be able to order a POD book via a website in much the way you can now order a photo via the Kodak picture kiosk website. It is good to keep track of EBM installs, though. Because at some point this niche is going to attract the interest of one of the big boys–XEROX, RICOH, etc–and instead of a kludgy contraption that runs in the up to 6 figures in cost, we’ll see a smooth polished device at half the price. And with a potential market in the tens of thousands of installations there just might be a business in *leasing* the things, the way other high-end office equipment is often delivered. In fact, if big publishing had two braincells talking to each other, they would do as Hollywood did and set up a mechanism to help their retailers upgrade their operations, to everybody’ benefit. HP is already dabbling in the niche, but so far as I know their equipment is more expensive (and also more capable). I can easily imagine a redbox style operation dropping an advanced POD station at convenience store all over and, as you suggested and as Redbox does, feed them through a unified online back end. Airports. Drugstores. Supermarkets. For that matter, in Japan they have book vending machines; every sight with one of those would be a logical spot for a POD book vending machine. Maybe I am being naive, but am I the only one who thinks it makes sense for one of the big online publishers (no, not Simon & Schuster/HarperCollins/Random House/Penguin , rather Apple/Google/Amazon) to subsidize/partner WITH the book seller (indy or chain) or the library ? And what if there was an option to ‘sample’ the first chapter in ‘booklet’ form (pun intended) at a reduced price ? I have a tough time seeing the downside for the brick and mortars. the only people it MIGHT damage, are the traditional publishers, because it loosens their grip just a tad more, but only if they hold to the same outdated strategies. That would be a good idea if the backend and frontend worked better. As it stands the EBM platform simply isn’t set up to do it. Any of the digital publishers (Apple, et al.) can build the frontend, I am sure (though I still cringe when I am forced to use what Amazon calls’discovery’), as well as experience in delivering distributed data to external partners via API. Having more than ‘casual experience’ with such, I am confident that it would take relatively little effort to implement such an API on the EBM, including confirmation/audit to keep people from emailing the EBM ‘print this book’ w/out paying for it ! Not sure what the point of that would be. As long as the Big 5 don’t want to participate, it’s not going to really take off. Maybe this has a future with Kinko’s or print shops? Or in education, providing a way for teachers to easily make workbooks. Print shops already have much of the equipment; they don’t need an EBM unless they plan to put it in the lobby next to the copiers. I feel compelled to point out that it has been possible to order a POD book through a website for several years now! Though it’s delivered to your door rather than picked up from a local retailer. The Espresso Machine in a library or academic environment makes a lot of sense. The idea that it will play a substantial role in bookstore retail does not, but is one of those memes that just refuses to die. That is one of the other problems with this kludged together design. EBM was originally built around Xerox equipment. 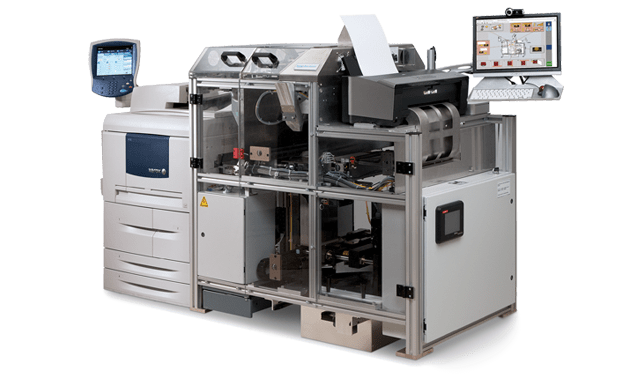 Xerox has been involved with book customization for at least 20 yrs when they used Docutech for customized textbooks which didn’t take off for a variety of legit reasons. Kodak used to make great copiers so probably a good choice. EBM is also expensive to run but good for high traffic academic and other communities and may do well in Maine for folks in more far flung areas.